In the past it was thought that the monounsaturated fatty acids in olive oil would be the reason why it is protective of the heart. However, newer studies have shown that it is the polyphenols and among these in particular hydroxytyrosol that lower blood pressure and protect you from hardening of the arteries. In a 2012 study from Spain it was found that mortality from heart attacks was 44% lower than that of a control group who did not incorporate olive oil in their diet. 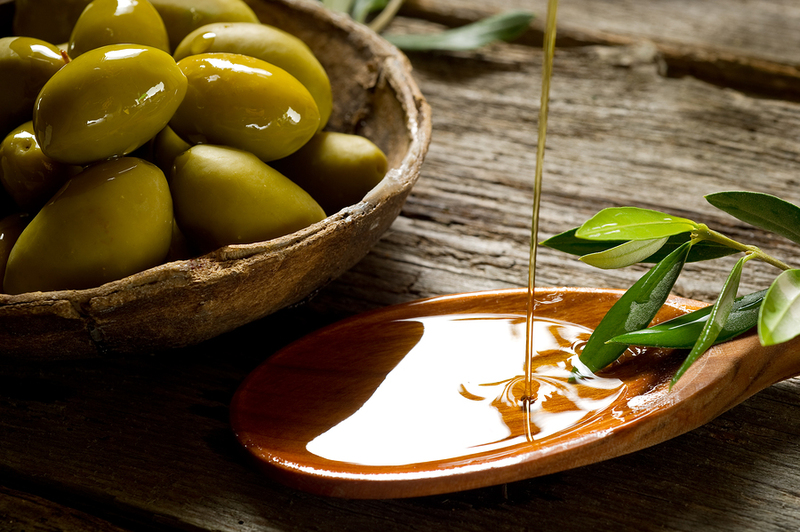 Only two tablespoons of extra virgin olive oil per day protect you from heart disease. It does so by reducing the total cholesterol level in the blood as well as the LDL cholesterol level. At the same time the more polyphenol is contained in olive oil (such as in extra virgin olive oil), the more HDL your body will produce, which is essential to extract oxidized LDL from arterial plaque. On top of that polyphenol rich olive oil will increase the size of the HDL particles (these larger particles are called HDL2), which are more efficient in extracting oxidized LDL from arterial plaques. A Sept. 2014 study in humans showed that higher polyphenol olive oil as found in extra virgin olive oil caused an increase in the more effective HDL2 particles, which cleans out plaques from arteries more efficiently than the regular, cheaper olive oil. The endothelium is the lining of the arteries. Normal endothelial functioning involves widening of the arteries and maintaining its flexibility. The body achieves this through production of a signal molecule, called nitric oxide; the endothelial cells that line our arteries from inside produce it. Exercise increases the production of nitric oxide as well (Ref.1). In a group of patients with poor endothelial function 2 tablespoons of olive oil (polyphenol rich) per day given over 4 months (the time of the study) showed a significant improvement of endothelial function. The authors suggested that an enzyme in the endothelial cells, called nitric oxide synthase is being stimulated by components of polyphenol-rich olive oil. This leads to protracted release of nitric oxide, which in turn keeps blood vessels flexible and wide open. Other investigators found that olive oil can influence even a hereditary gene variant of endothelial nitric oxide synthase found in people with a history of premature heart attacks. This high-risk group of people should take extra virgin olive oil regularly to prevent premature heart attacks and strokes. Endothelial dysfunction occurs when the arteries no longer can deliver adequate amounts of blood to vital organs like the heart or the brain. Endothelial dysfunction is also present in patients with type 2 diabetes, obesity, high blood pressure and metabolic syndrome. Introducing extra virgin olive oil in the diet of these patients will help restore their endothelial function. In a study on 23 hypertensive patients it was shown as far back as in 2000 that extra virgin olive oil over 6 months allowed physicians to reduce high blood pressure medications by 48%. When the study was crossed over, the reverse was the case for the control group on sunflower oil that had no such effect before. Based on what was said about endothelial function above, it is easy to understand that the polyphenols of olive oil released nitric oxide, which is known to lower blood pressure. This is an important finding as high blood pressure is a known risk factor for the development of hardening of the coronary arteries leading to heart attacks, congestive heart failure, but also stroke. Regular intake of 2 tablespoons of extra virgin olive oil often will reverse high blood pressure and restore normal endothelial function. In April of 2013 The New England Journal of Medicine published a Spanish diet study that showed that a participants on a Mediterranean diet with olive oil or nuts had 30% less heart attacks over 5 years than people on a low fat control diet. Other studies have also shown that olive oil and omega-3 fatty acids play a big role in preventing heart attacks and strokes. We also know that regular exercise reduces the risk further; so does keeping your body mass index below 25.0. Extra virgin olive oil is part of the protection from heart attacks and strokes, but it did not show protection against cancer. It is a simple fact that incorporating 2 tablespoons of virgin olive oil in your daily food intake will definitely have all of the beneficial effects described above. It is readily available, is inexpensive and very effective. It is also not difficult to work into your eating routine: add olive oil and vinegar or lemon juice to your salads, and cook with olive oil. If you have not totaled 30 grams (2 tablespoons), then make up the difference by eating an extra teaspoon full of olive oil. This is not all! You need to cut down on processed foods as they are made with the wrong oils, such as safflower oil, corn oil, soybean oil and others. These are usually omega-6 containing oils that cause heart attacks and strokes. They are cheap oils use by food processors, and they are not doing anything for your health! I would suggest that you read more about the powerful role of prevention that extra virgin olive oil has in our diet. Buy it and stick to it as a new healthy lifestyle habit. Two tablespoons a day is the weapon against disease! Ref.1. Current Medical Diagnosis and Treatment 2015, chapter 10 Heart Disease. By Thomas M. Bashore, MD; Christopher B. Granger, MD; Kevin Jackson, MD; Manesh R. Patel, MD: Heart Disease. Lange, 2015.